my dear, dear friend, m, is having a fall sale here! yipee! 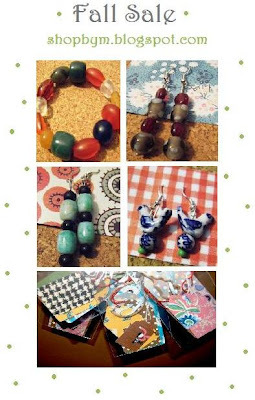 m sells jewelry of pretty colors and shapes and she's having a sale! great news? I think so. check it out because . . . well, christmas is only 48 days away! yikes! I will go take a look. I use to not like how CHRISTmas started so early in stores. But then, I thought 'I Love it'. Bring on the celebration of Jesus' birthday. What a wonderful thing to celebrate. did you notice you linked to my old blog! i haven't looked at it in a while! How are you? Your blog is so much fun and you are a beautiful lady. I wish we could have spent more time together in Mesa. I hope that you are well.